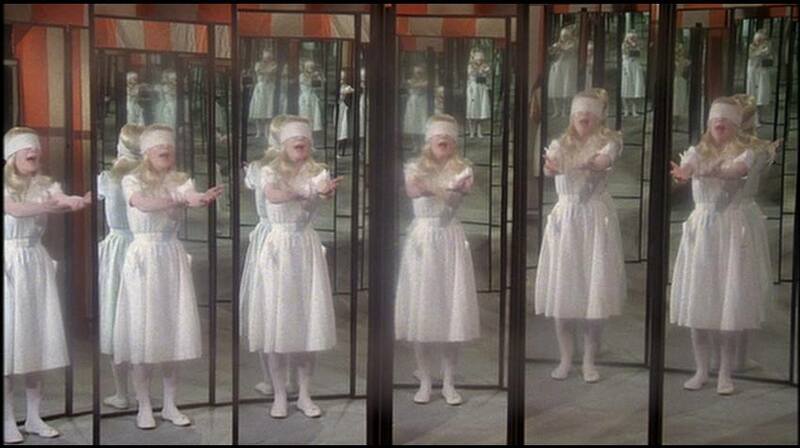 I only remembered three things about the Disney horror film: a girl wearing a blindfold appearing in mirrors, elderly Bette Davis and being scared after watching it. 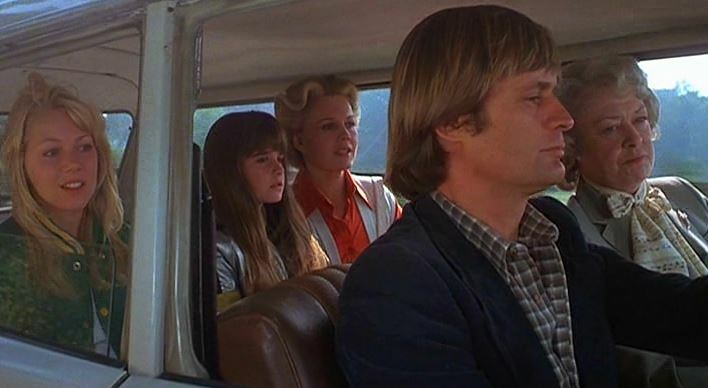 In the film, Americans Helen (Carroll Baker) and Paul (David McCallum) move their two daughters to England. Jan (Lynn-Holly Johnson) is an intuitive teenager and Ellie (Kyle Richards) is her younger sister. The family finds a large mansion for rent at a price that they can’t refuse, leased by elderly Mrs. Alywood (Bette Davis), whose daughter disappeared under mysterious circumstances 40 years ago. Much to the shock of several villagers, Jan looks very similar to Mrs. Alywood’s missing daughter Karen. Within the first few days of the family moving into the large home, Jan begins to experience strange disturbances: a window breaks by itself and leaves the shape of a triangle, she sees a blue circle in a river, she can’t see her reflection in a mirror, and a mirror breaks by itself and she sees a blindfolded girl pleading for help. Several other disturbances happen like something is protecting the Curtis daughters. At a motorcycle race, Ellie starts yelling for Jan and when Jan moves to her, a motorcycle lands and explodes where she was standing. Jan tells Mrs. Alywood about the disturbances, who shares with her about the night Karen went missing in the 1940s. Karen was with three friends in an old church. The church caught on fire and the three other teenagers escaped, but Karen did not. However, the church was searched and her remains were never found. The Curtis family, including Carroll Baker, moving to their England home. When Jan tries to ask the other three people who were with Karen about what happened, they are all too afraid to discuss the events. Only one man, Tom Colley (Richard Pasco) will say what happened. Karen was being initiated into a secret society when the church caught on fire. When a bell in the church fell, she disappeared. As Jan searches for answers, a spirit- or the watcher- is using Ellie to communicate with Jan to free Karen. During an eclipse, Jan assembles the original three people at the church to free Karen. Ellie enters, possessed by the “watcher,” and explains what happened on the night 40 years before. The watcher has been on Earth since Karen was sent to an “alternate dimension” by mistake. Jan stands where Karen stood as everyone holds hands around her, and Karen reappears, still 17 years old, and is reunited with her mother. The ending in the theatrical release is not what was originally released in theaters in 1980. 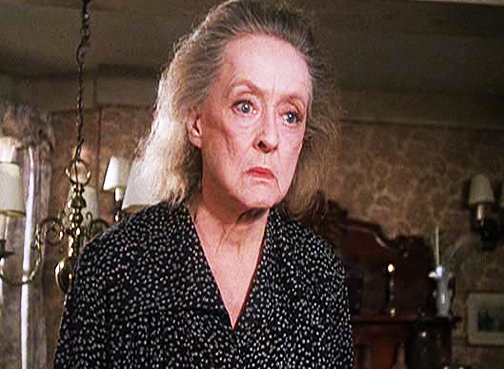 The film was also rushed to theaters to correspond with Bette Davis’s 50th anniversary as a film star. In the first theatrical ending, released for a week in New York City on April 17, 1980, the group still gathers in the chapel for a seance to bring back Karen. Rather than a beam of light coming over Jan and returning Karen like in the 1981 ending, an alien comes into the room, picks Jan up and takes her away. Jan’s mom runs into the chapel asking whereher child is, and Jan reappears with Karen. Jan returns Karen to Mrs. Alywood, and Ellie asks Jan what happened. Jan gives vague answers, still leaving what happened unexplained. Jan: I’m not sure. A place where people are changed into negative images. Ellie: How did she get there? Jan: An accidental exchange between the watcher and her. He needed my image to set her free. Ellie: So what happened to the watcher? “I challenge even the most indulgent fan to give a coherent translation of what passes for an explanation at the end,” New York Times film critic Vincent Canby wrote in 1980. Due to the cryptic ending, the film was poorly received and was said to not have an ending. 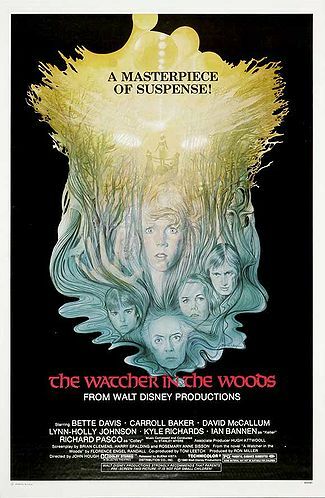 “Watcher in the Woods” was pulled from theaters, re-edited and released again in 1981. “We felt we had seven-eighths of a good picture, but the ending confused people,” said the Disney co-producer Tom Leech in 1981. The revisions took 18 months and cost $1 million, but the film earned $1.2 million after the second release in its first week. Many theater owners said if the alien science fiction ending was changed, they would be willing to take the picture, according to an Oct. 22, 1981 article, “New ending gives Disney movie second chance” by Aljean Harmetz. “The ending is seamless, satisfying, resolving the mystery,” wrote The Richmond Times-Dispatch after the second release. While I was revisiting “Watcher in the Woods,” I couldn’t remember how it ended. I was probably six or seven years old the last time I watched the film, and I’m not surprised that I didn’t remember Karen being in an “alternate dimension.” Even now, I found that explanation of the missing girl mildly confusing. However, the 1981 ending is admittedly more clear than the 1980 ending. I think my favorite part was seeing Bette Davis, 72, and Carroll Baker, 49, late in their careers. Davis unsurprisingly gave the best performance in the whole film. Though I’m not familiar with much of Lynn-Holly Johnson’s work, I believe Disney cast her because if you squint, she vaguely looks like former Disney star Hayley Mills. I think my biggest complaint with “Watcher in the Woods” is, while I enjoyed it, the story seemed to move awfully slow for an 82 minute film. Regardless, rewatching “Watcher in the Woods” was a pleasant trip down memory lane. I still found some parts genuinely frightening, such as when Jan is in the fun house, and Karen appears in every mirror pleading for help. “Watcher in the Woods” is a fairly dark horror movie for Disney but it isn’t that scary. However if it is still semi-scaring me at 25, you can imagine why I don’t watch more frightening horror films.